I had seen a few of Le Petit Olivier’s products around the place but had never actually bought anything from their range until a quick trip to London a few months ago. I was browsing the beauty section in a TK Maxx my friend and I walked past and saw this little guy sitting on the shelf. 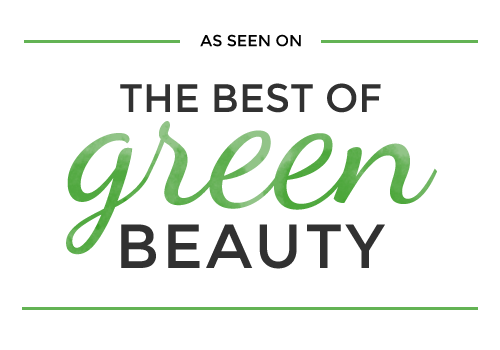 TK Maxx by the way often has some great deals on green beauty brands as well as toxic ones… I’ve even seen REN in there! Anyway, I wasn’t looking for anything in particular but had been on the hunt for a while for something to help tame my fluffy hair. I used to have an argan oil spray/mist that would do a pretty good job but I think it was probably full of toxic things as well… I used that up quite a number of years ago now… When I saw this 100% organic argan oil product in its lovely god box I couldn’t resist, especially once I was the ECOCERT label. I believe it cost me around £7.50 or something similar (it was a while ago now) which I didn’t think was too bad for 100% pure organic argan oil. Originally it was around £20 or something, or so it said on the label. I have since seen it on lepetitolivier.fr for €11.49. 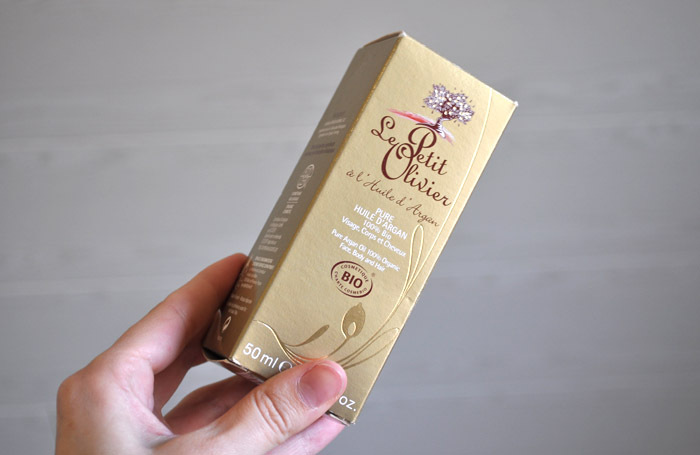 Le Petit Oliver was founded by Eric Renard and Xavier Padovani, two men who shared a passion for cosmetics as well as the environment, and they have been making beautiful, natural products since 1996. 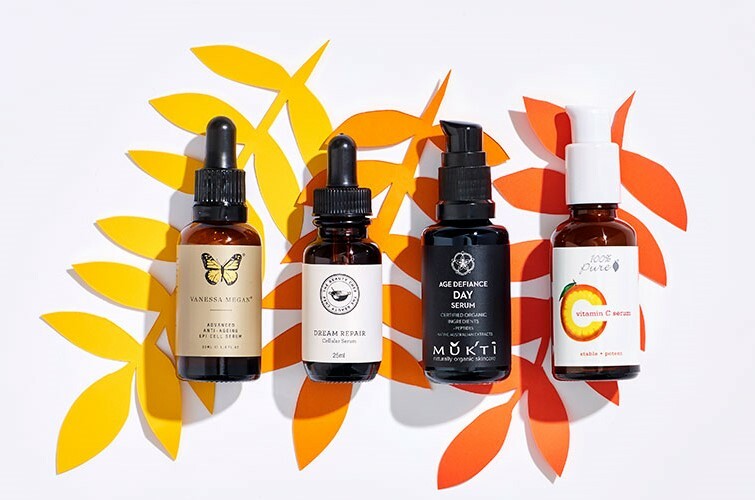 Their products are made to meet the ECOCERT and COSMEBIO standards; the company is dedicated fair trade, and they are also against animal testing, nor do they use any animal products other than those from beehives (honey, royal jelly). All ticks in my book. 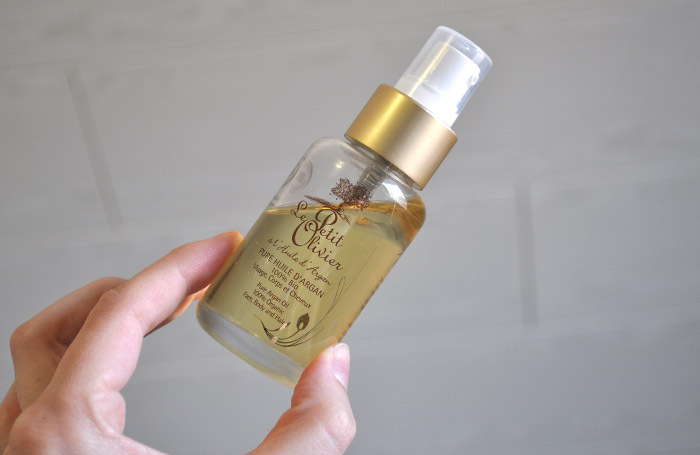 The Pure Argan Oil comes in a lovely, statement, golden box; beautifully, yet simply packaged. I’m still undecided on recyclability of boxes such as these, they’re so shiny and the inks are so bold that there much be something bad in them; but I chucked it in with the other recycling all the same. Once removed from the box, a clear 50ml (recyclable) glass bottle with a plastic pump is revealed. I did check this in the store (I should have) since oil should really be in dark glass to protect them from UV light. But it has been living in a box until it reached my home and I now only keep it in a cupboard so I wasn’t too worried (the bottle does also say “keep out of heat and light”). The light, golden coloured oil is almost colourless once you squirt some onto your hand, and it is also very runny/difficult to photograph! 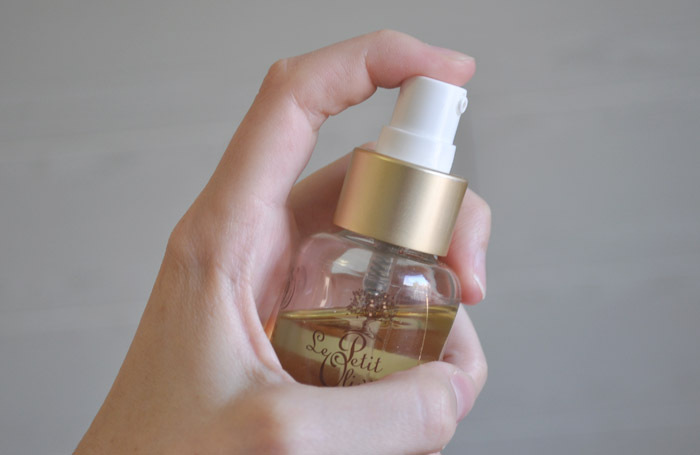 It is a very light oil, and easy to distribute. There is a very faint, slightly nutty odour. I had a bit of a google about this and pure argan oil is supposed to have quite a strong smell, so I have a feeling that this may have gone through a deodourising process? Not ideal for the product unfortunately. But then again I don’t another argan oil on hand to compare the scent with. I use this product at night as my “night cream” and also as an overnight treatment for my hair. I quite like it on my face, it takes a while to fully absorb, but never leaves oily marks on my pillowcases and I have never broken out from it. My skin just feels nicely hydrated. One pump will do my whole face and neck, but not my décolletage. I have now started using this layered with a rosehip oil I recently purchased. The very bottom layer of my hair, the one that meets the nape of my neck, is always very dry and frizzy and strange compared to the rest of my hair. I have no idea why and its very irritating. I separate this part out and smooth three pumps of the oil from root to tip. I then will distribute another couple of pumps through the ends of the rest of my hair and then braid it and leave overnight to wash out in the morning. This product vastly improves the weird dry bits. I have noticed a huge difference doing this weekly. I forgot about it for a couple of week to a month and could really tell that my hair was feeling bizarre again. Overall I am really quite happy with this product. I have enjoyed it effect on my skin and hair. Would I purchase again? Maybe, but I would probably check out some other argan oil products on the market first.